This practise usually comes along when we have some years of experience. It is a more demanding form of breathing practise which is co-ordinated with movement, usually with a bell or with a bokken. It requires commitment, concentration and persistence and it has a well-founded reputation for helping to develop our individual mental focus and willpower. 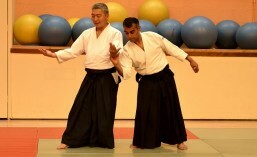 It is usually practised only in dojos away from shared public use and is always combined with Seizaho. The sessions can be quite long.